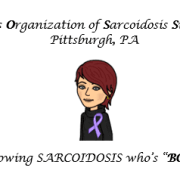 To raise money & awareness of Sarcoidosis - UNTIL THERE'S A CURE!!! I started BOSS when I was diagnosed with Sarcoidosis to raise Awareness for this disease that I couldn't even pronounce. I am proud to hold fundraisers to not only raise awareness but money for research and to help other "Sarkies" who live with this disease everyday that has NO CURE! Would you recommend Boyer's Organization of Sarcoidosis Sufferers?